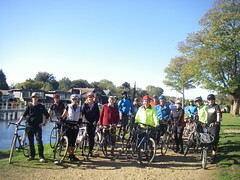 Wednesday 17th April, a largely bright Sunny day saw 16 Cyclists leave via the Portsmouth Rd track, with 1 extra ‘late starter’, joining us as we approached Winters Bridge, Long Ditton, Hinchley wood, – with a short delay whilst someone got his stamps !-, Littleworth, Esher, Fairmile, Cobham, Hatchford, Ockham, to West Horsley for lunch at the ‘Barley Mow’, then East Horsley, Effingham, Bookham, Fetcham, Leatherhead, Ashtead Common (Photo), – with a brief explanation of how the ‘Coal Tax’, helped the City of London maintain this & many other Commons & green spaces around the City-, Epsom Common, to the ‘Old Moat Garden Centre’ for refreshments, West Ewell, Tolworth, Berrylands to Kingston. 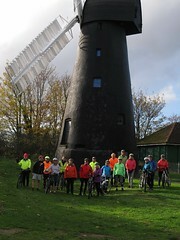 Total 32 Miles, 2 new Faces, thanks to Steve D for back marking, & others for marking corners. Sunday 7th April. A Cloudy day with some light Drizzle, leading to lunch, & a slightly heavier afternoon Shower, saw 25 Cyclists remember the early start from New Malden leave via, Raynes park, Cannon Hill, South Merton, Morden Hall Park, Mitcham, Eastfields, where 1 extra Cyclist was ready to join us, Lonesome, Norbury, Thornton heath, Selhurst, Heavers Meadow, South Norwood, & Country Park, to join the ‘Waterlink way’, Sustrans route, via Beckenham, Lower Sydenham, Catford, Ladywell – with 1 person taking a tumble, suffering a couple of Bruises-, Lewisham, Greenwich Park, (Photo with William the IV), to Greenwich to find that the planned Pub stop had no Food, so now past 1 o’clock, a strategic decision that Wetherspoons would cope, so passing the Cutty Sark, with a missed turn, but soon finding ‘the Gate Clock’, a successful lunch, then finding the distressing sight that 1 of our Bikes had been Stolen, 😦 (this coming on top of my own recent loss), & with a few others also needing to curtail the ride, the remaining 19 Cyclists continued via the Thames Path, Deptford, ‘Quietway 1’, via Folkestone Gardens & South Bermondsey, Burgess Park, Camberwell, Loughborough, Brockwell Park, – with the ‘now steady Rain-, it was decided to have an earlier than planned Tea & Bread pudding stop at ‘the Mansion Cafe’, with Rain soon stopped, 🙂,Tulse Hill, Streatham Hill, Tooting Bec Common, Tooting, Mitcham, Phipps bridge, the Rose Garden, Morden, Morden Park, Lower Morden, Morden Cemetery, Joseph Hood Park, Motspur park, -with 1 person deciding to leave the ride for Home, without realising, they had 4 others following-, to finish at New Malden. Total 39 Miles, 1 new face, 1 Cycle theft, thanks to Andrea for back marking such a large group, many others for marking corners & Special thanks to Derek for the BP. Sunday 17th March, (St Patricks day), Part 1, a largely Sunny Morning saw 18, no wait 1 more has joined so 19 Cyclists left via Lower Marsh, Berrylands, Surbiton, Long Ditton, Hinchley Wood, Esher Park, Esher, to Molesey, -some people must have had Skates on as we were to early-, but the ‘Bell’ did soon open the doors for a very enjoyable lunch, then Thames Ditton, Portsmouth Rd & track to Kingston. Sub total 14 Miles, thanks to Steve F for back marking duties, & others for marking corners. Part 2, with heavier Clouds, and a brief flurry of Hailstones, -was this a portent of things to come-, 3 Fresh faces & Farewell to 7, so 15 Cyclists left via Skerne Rd, Aerospace Estate, Ham, Ham gate of Richmond Park, to Petersham gate, Richmond, Richmond Bridge, Ducks Walk, St Margerets, Islesworth, Whitton, to Kneller Gardens, Twickenham for Tea & Bread pudding, suddenly we were hit with a very intense was it Hailstones, or was it very small ‘Snowballs’, perhaps a mix of Hail & Snow, -luckily there was just enough room to shelter from the worst of it-, continuing via Fulwell, with another very heavy Hailstorm, this time with nowhere to Shelter until it was too late, 😦 Teddington, Hampton Wick & Kingston Bridge. Sub total 12 Miles, Total for the day 27 Miles, 1 new face, thanks to Chris for Back marking, & others for marking corners, thanks to Derek, for the BP. Sunday 3rd March, a Blustery Wind, with some light Showers, saw 8 Cyclists, with 1 deciding not to continue, so 7 left via Skerne Rd, Latchmere, Ham Gate Richmond Park, via White Lodge, to Roehampton Gate, Barnes, Hammersmith Bridge, Fulham, Barons court, North Kensington, then the ‘Paddington Arm’ of the ‘Grand Union Canal’ towpath, to Harlesden for lunch at the Grand Junction Arms’- with fresh Paint still in evidence-, more Towpath to Park Royal, West Acton, Ealing Common, Gunnersbury Park, (Photo), Carville Hall Park, Brentford, to Syon Park Cafe for Tea & Bread pudding, with a slightly stronger Head wind, & some heavier Showers, (but not as dramatic as had been Forecast, 😉) Isleworth, Twickenham, Strawberry Hill, Teddington, Hampton Wick & Kingston Bridge. Total 29 Miles, 2 new Faces, thanks to Derek for Back marking, thanks to John for the BP. Note: Please do have a look at Matt’s post regarding Kings Rd, if you are at all familiar with the area near Kingston gate, it is increasingly apparent that action is needed to address the traffic issues in that area. Kingston Council recently published a consultation for changes to King’s Road; New Road and Tudor Road in North Kingston close to the Kingston gate access into Richmond Park. This consultation follows concerns raised over a number of years about the amount of through traffic using these roads and the number of collisions which have resulted in a large number of injuries to people walking and people on bikes. Despite Kingston Cycling Campaign agreeing with the Council and local residents that there is a significant issue of too much through motor traffic using these roads, we do not support the Council’s plans to deal with this issue. The Council plan to change King’s Road; New Road and Tudor Road so that they are one-way for motor vehicles rather than two way. This would be done through changes to signage and paint markings on the roads and minor changes to the kerbs on King’s Road. Cycling will continue to be allowed in both directions on these roads. You can access a plan of the proposed changes here. By changing the roads to one-way for motor vehicles, the Council believes that motor vehicles will be better managed on the affected roads, reducing congestion and the number of times vehicles get ‘stuck’ trying to pass each other on these narrow roads. We agree that the proposals will improve the flow of motor vehicles using these roads but that this could increase the number of vehicles using these roads as the traffic becomes better managed. It is also acknowledged that changing King’s Road to one-way is likely to have a significant impact on surrounding roads with traffic displaced onto New Road and Tudor Road. Alexandra Road (with two schools) may also see more traffic too. Furthermore, the Council believes that traffic speeds could increase as a result of these proposals. The Council intends to introduce further traffic calming in an attempt to mitigate the expected increased speeds but the work proposed in the consultation is limited to replacing speed cushions on King’s Road with speed humps and adding speed cushions to New Road (no changes to implement speed reductions appear to be planned to Tudor Road). However, with cars increasing in size and an increase in the number of 4x4s on the road, speed cushions and humps are increasingly ineffective. Overall, we do not believe that potentially increasing the number of motor vehicles using these roads and their speeds will lead to safer roads nor will it encourage more people to walk or travel by bike. We will be objecting to these plans and will instead ask the Council to consider bolder plans to reduce through traffic through the area. Other areas in London (including Waltham Forest) have stopped vehicles using residential roads as through roads for motor traffic using simple (and relatively cheap) interventions such as adding bollards to the end of a road. This still allows residents to access their property but stops through traffic from using the road by keeping through traffic to main roads which are designed to deal with larger volumes of traffic. Recent changes in Waltham Forest have shown that reducing through traffic using residential roads can decrease motor traffic across the wider area as people stop taking unnecessary journeys by motor vehicle and switch to sustainable methods of transport such as walking and cycling. Stopping through traffic would return the road to people and make it a better neighbourhood for local residents and people travelling through the area by foot or on a bike. In the Netherlands, these types of streets are so common they have a special name “Woonerf” but there are examples in Kingston too. For example, Chatham Road and Bonner Hill Road (not very far away from King’s Road) both have measures which stop through traffic. Although closing a road to through traffic can seem a big step, it is relatively easy to trial changes through temporary blocks which would allow the Council to assess if the scheme works or if it needs to be changed. The Council’s proposals are unlikely to reduce through traffic and, as the Council notes, could increase traffic speeds. This therefore does not do enough to protect the safety of vulnerable road users on these roads. The Council should be bolder in its proposals and look at ways to reduce through traffic using these and surrounding roads (including Alexandra, Liverpool and Crescent Roads) to keep traffic to the main roads such as Kingston Hill. If the one-way proposals were to go ahead, we are concerned that the contraflow cycle lane on King’s Road is in the ‘dooring’ zone creating a risk to cyclists. In addition, we would like clearer paint markings on New and Tudor Road to show people in motor vehicles that contraflow cycling is permitted on these roads. We would also like further traffic calming to be considered for Tudor Road (particularly as it is part of a signed cycle route). You can also ask the Council to improve this scheme with your thoughts here. The consultation deadline is 8 March 2019. King’s Road. A narrow two-way road with proposals to change it to one-way for motor traffic with contraflow cycling allowed. 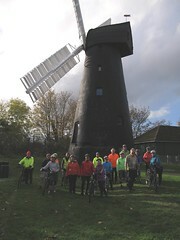 Wednesday 20th February, a Bright but Cloudy day saw 14 Cyclists, -with a new leader, (Steve J), leave via Portsmouth Rd & Track, Long Ditton, Giggshill Green, Weston green, Esher, Walton on Thames, Thames Towpath, the ‘Broadwater path’, Weybridge, Wey Navigation Path, Weybridge Rd track, Chertsey Meads, Chertsey, -where yours truly picked the wrong moment to look at a text, leading to an encounter with a Wooden post, thankfully no harm done to me, the Bike or indeed the Post, 😉-, the Twynersh Roundabout, Thorpe to Thorpe Green for lunch at the ‘Rose & Crown’, Virginia Water village, Windsor Great Park, & Virginia Water , & the Totem pole, (Photo), Egham Wick, Callow Hill, Trumps green, Lyne, Chertsey, Chertsey Bridge, to Shepperton for Tea & Refreshments at ‘Nauticalia’, Sunbury, Hampton, Bushy Park, Kingston Bridge. Total 37 Miles, 1 new face, thanks to Steve D for back marking, others for marking corners, very special thanks to Steve J for organising & leading this ride. Sunday 17th February, a bright sunny day saw 36 Cyclists, (is this a Record), but without our regular leader, who was suffering a heavy Cold, (he claimed his nose was ‘running like an Express, 😦), thanks to Mike for filling the gap at very short notice, so via Lower Marsh, Berrylands, New Malden, Worcester park, Sutton, Carshalton, Carshalton Park, Oaks Park to Woodmansterne, for lunch at ‘the Woodman’, with a small detachment continuing to Pistachio’s in Banstead, re-gathering, in Banstead, Burgh Heath, Tattenham corner, Epsom, the ‘Nescot Path, East Ewell to a very congested Nonsuch Park Cafe, for Tea & Bread pudding, then Worcester park, New Malden, Berrylands to Kingston. Total 29 Miles, thanks to Jon W for back marking & for the Photo, many others for marking corners, thanks to John D for the BP, and very special thanks to Mike F for leading at such short notice. Sunday 3rd February. A cold, Sunny day saw 14 Cyclists gather for the first Challenge ride of 2019, leave via Skerne Rd, Latchmere,- with 1 person having Gear & Freewheel problems, deciding to leave us-, Ham Gate Richmond Park, to Sheen gate, Sheen, Mortlake, Chiswick Bridge, -with 1 extra Cyclist, managing to predict our route, so back to 14-, Chiswick, Acton, – with a visit from the ‘P Fairy’, the victim insisting on the rest of the party continuing, – Park Royal, Stonebridge park, Wembley, where an Icy Cycle path caused our Leader to have an unplanned dismount, (a useful lesson to others to take it easy), Preston, Kenton, Kenton Park, Belmont to Harrow Weald for lunch at ‘the Duck in the Pond’,-with the ‘P victim’ managing to join us-, followed by a ‘steady climb’, to Harrow Weald Common, (Photo), Hatch end, Headstone, Headstone Manor Park, West Harrow, South Harrow, Northolt Park (a former Race track, the reason the area is now known as ‘the Racecourse Estate’), Northolt, Northala Field,- with no enthusiasm for an ‘alfresco tea stop’, Greenford, Southall, Norwood Green, to Osterley Park for Tea & Bread pudding, Osterley, Hounslow, Whitton, Twickenham, Strawberry hill, Teddington, Hampton Wick & Kingston Bridge. Total 42 Miles, 1 visit from the P fairy, 1 other Mechanical, 1 Icy slip, thanks to Andrea for Back marking duties, & many others for marking corners, thanks to John for the BP.